Reserve Simply the Smokies Today! We really Wnjoyed Our Stay!! Thank you Again USA Cabins ! This cabin was everything and more. The beds was very comfortable. The cabin was also very clean and spacious for family. We will be using Cabun USA again. We had and great time and the cabin was amazing and comfortable. Cabin worked well for our family- only issue was parking and access road. This cabin was amazing for our group. We will be back at some point! Thank you. Cabins U.S.A.! Our stay was very nice! We really loved it! Very spacious and supplied us with all are expectations! The only thing I didn’t like was the super steep hill and the narrow street! Scary to me! The parking was very small as well. Other than that I would definitely recommend it. The air hockey was replaced with a tabletop arcade games which my children couldn’t stay off of! We loved it! Hot tub not working. Not enough silverware for 10 people. Low water pressure on main and top level. Air hockey table not in cabin although listed in cabin description as one of the amenities. Charcoal grill perilously close to shrubbery. Need to watch very closely while grilling. Thin sheet of ice under crispers in refrigerator and some water had to be mopped up shortly after we arrived while stocking refrigerator and throughout stay. Tight parking although we managed to park one large Infiniti suv, a Mini Cooper and a Kia Soul in the space. Had a wonderful reunion with family but would not choose same cabin in future. I was So upset upon arrival finding out there wasn’t an air hockey table. Having 8 kids copped in a cabin for the weekend with only a pool table for the boys. To me it was false advertisement. Also there were lady bugs & stink bugs absolutely everywhere. We were havining to kill & pick them up all weekend long! It was ridiculous! The parking wasn’t even big enough to pull in two suburban side by side. We had to try the cars sideways to get them in. The cabin over all was nice & if they get the big issue under control we would stay there again. Over all we did have a great weekend! Very nice cabin, great value, in a quiet but convenient location. Everything was completely clean and in perfect working order. Text requests for service were responded to in good time. The cabin was very nice. We enjoyed our stay, but, upon arrival there was very little water coming out of any of the faucets. I had read about this problem in several reviews and I called before we went and I was assured that this problem had been corrected. I called and reported this problem and within 5 minutes a repair man showed up and corrected the problem. We did not like the driveway or the road that this cabin was on. It is a steep road and the driveway is small and you would have a problem if you tried to park 2 vehicles. I had called 2 times before we went and asked if it was a steep road or would we have any problem if it snowed or became icy, I was told that there would not be a problem, but there would be. If it were icy you would have a hard time getting to or from the cabin. We would rent from the company again and from the same property, just not this cabin due to the water problem, that seems to be ongoing and the location. The cabin had very comfortable beds. We were told that the cabin would be decorated for Christmas and it was not. All in all these were minor irritations. We loved the cabin, just wishing that it was in a different location. This is a beautiful cabin in a beautiful location. If you read all the reviews, you will find the same issues: parking is extremely tight and water pressure is bad (we noticed that it got worse as more people populated the other cabins). Still worth it. Our biggest problem was that the electronic lock on the door lost its battery power late one night when we came back. We called Cabins USA and (along with an elderly, disabled family member and several children) waited over 45 minutes in the cold for a maintenance person to come fix it. This was unpredictable and could have been avoided if staff would regularly check/replace lock batteries. Overall, this cabin was a good value. I would recommend it, with the noted exceptions. The parking is very bad, you can barely get to smaller vehicles parked, so if you have a large vehicle or more than one you will have parking problems. The description of the cabins says it has a pool table and air hockey table, but there is no air hockey table. The kitchen is small but easy to use. We had AC problems the last two night we were there, but when we reported it they sent someone out to check it. When we checked out I try to call all day on our trip back home to tell someone there was still an AC problem so it could be addressed before someone else checked in but never could get in touch with a real person to tell them I was checking out or about the problem. The cabin was great very clean and in a great location to easy to use Teaser and not have to get onto the parkway. You do have a little noise from people going up the mountain. It would seem to me, you could have problems getting to the cabin in snowy or ice weather affecting the roads. After 3 or four people took showers there was no water for about an hour. Everything else was good. We will use cabins usa again but not this property. Made the reservation with Tina. She is really nice and patient to help me out with all my concerns. The Cabin is nice and clean. We had some minor issues. First, the parking is not easy. We only had two cars, so we figured it out how we gonna park our cars. you would have a problem if you have more than two cars. Another issue was the shower room on the third floor. If anyone is using the water downstairs, there would be no water for the shower room on the third floor. Or the water would stop running when you shower if someone is using the water downstairs. That's probably has something to do with the water pressure. We did call for maintenance, and they came. But still not working right. What we did was tell the rest of our friends not to use the water when we need to shower. And that worked. After all, it is a great week for us, we enjoyed our stay, would recommend this to anyone. Thank you for taking the time to let us know about your recent stay in Simply the Smokies.! We here at Cabins USA strive to give each of our guests the best stay possible while vacationing in the Smokies. I apologize for the issues you experienced with the water pressure. Your comments have been forwarded to our maintenance department to be addressed. When you are ready to stay with us again, please mention you are a return guest for an additional discount. Thank you for choosing Cabins USA and we look forward to having you as our guest again soon! My only issues with the cabin is the drippy kitchen faucet which was not repaired just told by maintenance to move the faucet around till it didn't drip or run. Also the broken blinds on the main floor and the lower floor. Tammy at customer relations was great to work with, especially when we had to be moved to a different cabin at another resort due to the HOA shutting water off for two days at Simply the Smokies. We will definitely use Cabins USA again for our next trip to the area. Thank you for taking the time to let us know about your recent stay in Simply the Smokies! 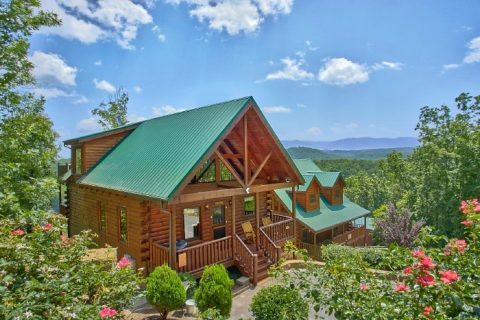 We here at Cabins USA work hard to ensure each of our guests have the best stay possible while vacationing in the Smokies. When you are ready to stay with us again, please mention you are a return guest for an additional discount. Thank you again for your review and thank you for choosing Cabins USA! This cabin offers privacy to each guest since the four bedrooms are on three different floors. With this many bedrooms it offers accommodations for several guests, however the parking is very tight if multiple families are bringing their own vehicles. The parking is quite narrow. When we parked our Equinox and Malibu side by side, we could not open all of the doors to get out of the vehicle. You have to get a little creative with your parking and I definitely do not recommend bringing more than two vehicles. The amenities are nice, and I am sure that anyone who stayed over the Christmas holidays would have appreciated the Christmas tree and other Christmas decorations, however we stayed at the end of March and checked out on April 1st, and the Christmas tree was still up. The tree took up valuable space in the living room that could have been used for an extra seating area. Lastly I would like to mention one small inconvenience – no paper towels were left in the kitchen. The other paper products and detergents had a starter supply, so I am guessing this was just a mistake during our visit. While it wasn’t a big deal, it was inconvenient to have to stop to purchase a roll of paper towels because we did use the kitchen for cooking and did need to have the paper towels. A dish towel was available for us to use until we could make a trip to the store. All in all, we would stay here again because it was a good value for the space that was offered. This is a great property for a large group, there were 9 of us, comfortable fit. Parking is a little tricky for more than 2 cars but can be done. Would recommend express check-in and out, absolutely the greatest idea ever! Great cabin! My husband and I will be returning in May for a long weekend, and will definitely be using Cabins Usa. I am so happy to hear that everyone enjoyed their stay in Simply the Smokies! We here at Cabins USA work hard to make sure each of our guests have the same great stay you enjoyed while vacationing in the Smokies. When you are ready to stay with us again, please mention you are a return guest for an additional discount. Thank you again for your review and thank you for choosing Cabins USA! What a beautiful cabin and stay. Sarah Toler was OUTSTANDING with our booking and all communication surrounding our stay. Cabins USA, made our vacation relaxing and effortless, with easy express check in & out procedures. The driveway and parking, was a little cramped....but nothing we couldn't overcome. The cabin accomadations and entertainment were GREAT! We were able to look out from any of the three decks, to see those majestic mountains...in the distance. I would definitely recommend "Simply the Smokies." The cabin was great & very clean. Two problems ,no garbage pickup all week & not enough parking. Thank you for taking the time to let us know about your recent stay in Simply the Smokies. We here at Cabins USA work hard to make sure each of our guests have the best stay possible while vacationing in the Smokies. When our guests require a trash pick up, all they have to do is call the office and we will be more than happy to send someone out to take care of that. When you are ready to stay with us again, please mention you are a return guest for an additional discount. Thank you for choosing Cabins USA and we look forward to having you as our guest again! I would highly recommend Cabins USA, they were awesome to work with and made the process very easy. Linda went beyond the call of duty and stayed on the line and booked our last minute reservation at 10:00 at night even when they were closed while we were in Pigeon Forge. Thank you to Cabins USA for a wonderful experience and we look forward to our next trip to the area again next year!! I am so happy to hear you enjoyed your stay in Simply the Smokies. Our employees appreciate being recognized for their excellent customer service! When you are ready to stay with us again, please mention you are a return guest for an additional discount. Thank you again for all of your kind words and thank you for choosing Cabins USA! We loved our week at the cabin. Your spiders on the deck get pretty big in TN. There was plenty of room for all of us & the kids loved the pool table, video games and the darts. The only part we had any problem with was the garbage cans not being animal proof. We got hit twice :) But over all that was the only negative part. Thanks again & in the future we will be back. Thank you for taking the time to let us know about your recent stay in Simply the Smokies! We here at Cabins USA work hard to make sure each of our guests have the same great stay you enjoyed while visiting the Smokies. I apologize for the issue you experienced with the trash. Your comments have been forwarded to our Owner Liaisons who will bring this to the owner's attention. When you are ready to stay with us again, please mention you are a return guest for an additional discount. Thank you again for your review and thank you for choosing Cabins USA! Thank you for taking the time to let us know about your recent stay in Simply the Smokies! We here at Cabins USA work hard to make sure each of our guests have the best stay possible while vacationing in the Smokies. Thank you for letting us know about the dishwasher. Your comments have been forwarded to our maintenance department to be addressed. When you are ready to stay with us again, please mention you are a return guest for an additional discount. Thank you for choosing Cabins USA and we look forward to having you as our guest again! This is a beautiful cabin that is close to everything but far enough away that you get that peaceful mountain feel. My only complaint was that the pool was not open-it was mid May and in the high 80's so a dip in the pool would have been great. However, we will definitely return to this property! Thank you for taking the time to let us know about your stay in Simply the Smokies! We here at Cabins USA work hard to make sure each of our guests have the best stay possible while vacationing in the Smokies. I apologize you were not able to utilize the pool during your stay. All outdoor pools are seasonal amenities and will be available for our guests during the summer months. When you are ready to stay with us again, please mention you are a return guest for an additional discount. Thank you for choosing Cabins USA and we look forward to having you as our guest again! Our overall stay was great. The cabin was clean and in a very well kept manner. However the only things we did not like was the parking. Simply the Smokes sleeps 12 people but the parking was more like for only 2 cars. The parking area needs to be bigger. Also the kitchen stove and sink area's were very small when it came time to prepare a meal for 12 people or let alone 2 people try to cook together. Last but not least the grill. That grill is in a very dangerous place. It's strategically place directly between 2 trees that are way too close. They are so close you can see the one on the left burning as you use the grill. The grill or the trees should be moved. Overall we had a great time and would us Cabins USA again. Thank you for taking the time to let us know about your recent stay in Simply the Smokies! We here at Cabins USA work hard to make sure each of our guests have the same great stay you enjoyed while vacationing in the Smokies. Thank you for letting us know your concerns about the location of the grill. Your comments have been forwarded to our maintenance department and our Owner Liaisons and they will be assessing that situation. When you are ready to stay with us again, please mention you are a return guest for an additional discount. Thank you again for your review and thank you for choosing Cabins USA! Although our stay was good and we like to use Cabins USA, there are a few things I would like to mention. There were no linens found for the sleeper sofa on the ground floor; both sleeper sofa mattresses were very uncomfortable; no WIFI password was found anywhere in the cabin and we had to call to obtain; there were to be notes put in our file for arrival as some people would be there before others to check in and there were none so it made for an aggravated check-in; and for a cabin that sleeps 12 the parking is horrible as 12 people are not going to arrive in 1 or 2 cars. Very Nice Cabin but very pricey probably due to all the fees that were added but had a very nice time.